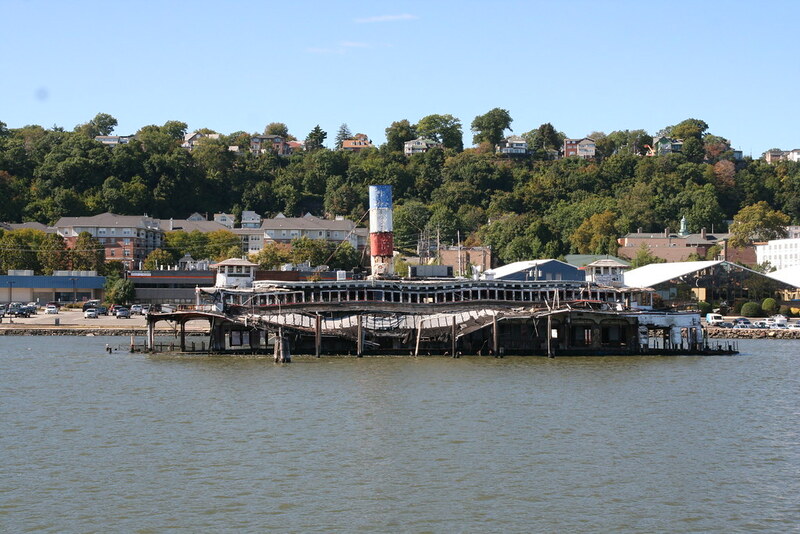 The National Register-listed Ferryboat Binghamton is looking for a new home. Currently resting on a mud flat at her mooring in Edgewater, NJ, she is the last extant steam-powered Hudson River ferry. Launched in 1905, she served every day between Hoboken, NJ & Barclay Street in Manhattan until 1967. In 1975, she was converted to a floating restaurant which operated until 2007. Left open to the weather and the impact of Superstorm Sandy in 2012, she is in need of a major restoration. A public notice has been issued for qualified parties to enter into an agreement to remove her from her current site in order to preserve & restore her. The deadline to express interest is June 29, 2016. Interested parties should email: ferryboatbinghamton@gmail.com . Without a new owner, the Binghamton will be demolished. Please share this post. Help the effort to find an investor & save the 111 year-old sole surviving Hoboken Ferry Company boat. Before Sandy, the owners of the Binghamton had already shut down the restaurant (it had been declining in food and service quality for a number of years). There was some talk about moving the Binghamton to the northern most ferry slip at Hoboken Terminal. All of the slips were restored to accommodate the smaller New York Waterways boats except for the northern one which was left in its original configuration and thus could have theoretically housed the Binghamton. My understanding is the Binghamton owner was very difficult to deal with and (surprise) had an inflated view of the value of his ship. I believe they were already in arrears on taxes,fines, etc. It would have been a neat solution. I think it is past the point of no return. It gives you that sinking feeling, reminiscent of the S. S. Nobska. At what point would this be too far gone to restore? I have a passing familiarity with Marine architecture but this thing looks to me like it is a pile of fire waiting to happen. Yes, I'll admit our community has done some amazing things but this looks like a hole in the water that is ready to collapse in on itself at any moment. The wood superstructure looks to be gone and would have to be reconstructed, but the hull is what matters and it's impossible to say. Much of it would depend on the shape she was in before she was abandoned. If she was getting close to needing major drydock work, there very well might be no coming back from this. Sadly, we all know it's a moot point even if her hull was in pristine shape if they performed a survey. Too bad she's gone. Our country definitely hasn't done a good job of preserving bits and pieces of its ferry history. Outside of the rail ferries SS City of Milwaukee which is a museum ship in Manistee and the SS Badger that is still earning her keep in commercial service, precious little survives with only the SS Eureka in San Francisco coming to mind right now for me. Even historic examples that lasted in revenue service into recent years inevitably always seem to disappear, like the 4 Steel Electric class ferries from the Puget Sound run that were built for service on San Francisco Bay for the Southern Pacific before the Golden Gate put them out of a job a few years into their life. They kept sailing until the latter half of the previous decade and still ended up in the scrapyard despite being over 80 years old and with a proud history in two different regions of the West coast. They went out with very little outcry from our modern society that cares little about its history and is too busy with their heads glued to their cellphones to care. At least we've done a decent job representing our naval heritage in this country, although with some glaring holes like letting the USS Enterprise, the most decorated American vessel of WWII, go to scrap nearly 15 years after the end of that conflict. Still letting big ones escape even now, like scrapping the last T2 tanker from WWII while examples of the Victory and Liberty classes have proven to be excellent attractions. There's a very valid argument that the T2 tanker did more to win the war than the much more famous Liberty class did. But alas, oil tankers don't seem to have the same appeal and the survivors all were towed to the scrapyard in the last 5-10 years as the Navy cleared the mothball fleet of anything older than 1965 or so. Last edited by LeoA on Fri Apr 08, 2016 3:42 pm, edited 1 time in total. Bringing us back around to the New York Central #16 scrapping of a few years ago, it sat on the bottom at Arthur Kill for many years before it was dredged up and transported to Cape Cod, for use as a display at a restaurant. However, after the restaurant closed, a consultant for CVS pharmacy declared the partial tugboat "unsafe" and it was scrapped. At that point it was in far better condition than the superstructure of the Binghamton is now. And there was very little public support for relocating the railroad tugboat again despite it only involving cutting it in several pieces and putting it on a barge, the same way it originally got to the restaurant site on Cape Cod. So I can't envision much public support emerging for saving this ferry, there are so many other preservation projects that deserve funding and actually have a chance of being completed someday. The time to save her was 15 years ago. The engine room has been totally flooded for some time now. She is on the bottom, and I am sure, thin as a razor blade. Before Sandy, most of her artifacts were still intact, and would have been a good time to preserve atleast some pieces, but all that is gone. The USCG wanted a boat to stand by her during Sandy, but they could not find anyone crazy enough to do it. Unfortunately, the only way the Bing is going to leave her current spot, is in small pieces on a barge. The lack of rail marine preservation really pains me, especially considering the amount of steam running right into the late 1960's. One of my newest photos of her a few months ago. It has since gotten worse. Lots of other more worthy preservation projects. In all seriousness, what a shame. Another piece of history gone. I seem to recall there is an old PRR dock somewhere, anybody know about it? Tend to agree that the Binghamton is a gonner at this point. The National Register nomination form makes interesting reading and I have added that as an attachment. A couple of key points in my mind based on some experience I had with the CNJ Cranford when that was cut up in Brielle back around 1982 or so. Per the nomination form, the boilers were indeed removed and replaced with cement as ballast. It would appear from the form that the engines were left intact to form the center piece of a lower dinning room or pub. So, the question to ask is what can be saved from the engine room. I can scan my slides of the Cranford after the complete super structure and deck had been removed exposing the mechanicals of the ship if there was interest to anyone. As seen with the Cranford which was also flooded for many years, the brackish water is not kind to the iron and such. Keep in mind also that there is a lot more than engines and boilers down in the hull. Numerous steam pumps and steam generators are down there as well ranging in size from small for some of the pumps to damn big as in the engine itself. Seems to me the Cranford’s cylinder block was one piece. The engine bed was never removed and went to the bottom when the Cranford’s hull was towed to sea and sunk. It was too big to get out and too massive to torch it. In the end, I don’t think the guys cutting up the Cranford made any money at all. Of course with enough money anything can be saved and restored. If anything, what the Binghamton has going for it right now is that scrap prices are low. No one will get wealthy cutting it up with the mostly wood super structure, cement ballast and large chunks of iron to deal with. Anything valuable has already been removed from the wheel houses. In reading up on the Cranford it was sold for $1 to the scrappers and again I doubt they made any money. And most likely, the idea will be to keep the hull somewhat intact so that it can be floated out to a reef. Again, cutting it up is not a money maker which should be good news for a preservation effort of at least part of the boat. On the west coast, we do have the Southern Pacific Ferry, Berkeley. Built 1898 for use on San Francisco Bay, taking passengers from San Francisco's Ferry Building to SP's Oakland "Mole." It is now at the San Diego Maritime Museum. While not operational, the engine room is open to visitors. The boilers have some "Disneyland effects" to almost look and sound like they have fires going. The propellers (she was the first screw propeller ferry on the West Coast) have been removed and motors hidden in the shaft alleys turn over the triple expansion steam engine. They have some of the auxiliaries running on compressed air. While she was a railroad owned and operated ferry, she didn't haul railroad cars. Just passengers and their baggage. Finally demolished 2 weeks ago. In the photo of barge "Weeks 84" you can see one of the engines. Zoom in on the photo. That's a shame. She had a rare four-cylinder double-compound (two high-pressure cylinders and two low), which was kept as a centerpiece when the rest of the engine room was gutted for dining space. One of the articles I read about the demolition mentioned the possibility of saving the engine, but I imagine being submerged in brackish water the last few years didn't do it any favors. There have been several opportunities to save railroad ferries from North River service over the last 30 years, but the required brotherhood of railroad and marine buffs never happened. While we mourn the loss of Binghamton, we should also celebrate the preservation of the Lehigh Valley tug Cornell and the couple of railroad barges that are still with us. They may not be ferries, but they are what's left. The NY harbor maritime operations of the anthracite railroads will go down in history as one of the most unique services in American railroading. There are still a few dockside structures to preserve, but it looks like Cornell will be the last of the self-powered boats.